Trustworthy, dependable and affordable, this cassette player/recorder still delivers value to classes that don't have the luxury of replacing older media with newer technology. The CAS1500 is a rugged & affordable monaural cassette player/recorder that is ideal for listening centers, story time activities, literacy groups, ELD and ESL learners. It can be used for individual and small group learning situations. 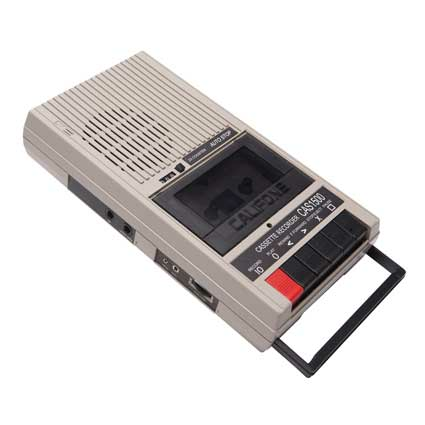 This economy cassette player/recorder comes with two ¼” headphone jacks for two learners to listen with connected headphones to content without disrupting others around them. A monaural jackbox can also be used to expand the number of participants. The CAS1500 is built with durable ABS plastic to withstand day-in and day-out student use in classrooms and libraries. It has a built-in microphone for students to record their responses and playback for modeling and to check individual progress. The CAS1500 is available individually and as a learning center. The center includes an 8-position monaural jackbox (1218AVPY) with individual volume controls and six monaural headphones (2924AVP), each with ambient-noise reducing over-the-ear earcups, ¼” plug, and a permanently attached 6' coiled cord.